April Fools is right around the corner. Have you been planning a prank to use on your friends or family? In order for April Fool’s Day to run smoothly, we’ve created our own list of rules to abide by. While the day is meant for amusement and giggles, it can end up going terribly wrong if you are not careful. 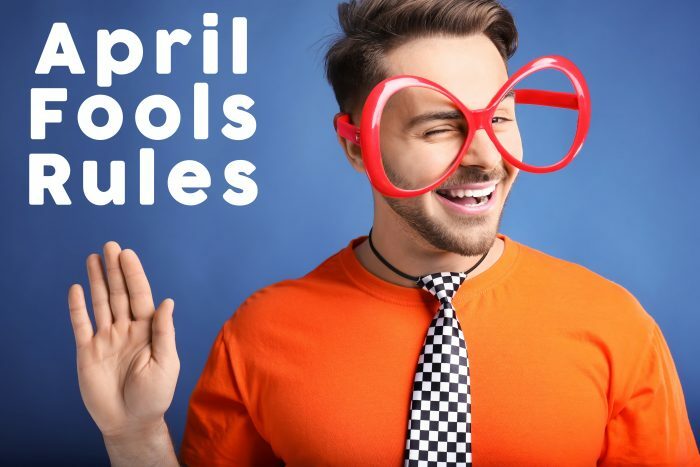 Because April Fools lands on a weekday, it’s even more important to be careful if you’re playing pranks at work. While deciding what kind of pranks to play on your family, take these rules into consideration. It’s never cool to cause damage to someone else’s property. For example, egging, tagging, or even saran wrapping someone’s car should be off limits for your April Fools Day plans. While it may seem harmless, you could accidentally cause damage to someone’s personal property that could result in an insurance claim. Contrary to popular belief, the “I’m pregnant” joke is no longer funny to some people. While you may think the idea is “genius”, the effects could be a little more serious. Who knows, maybe your significant other has been dying to have a baby–the joke could break their heart. Try not to play a prank on the older folks. Avoid startling people. You never know who could have a heart condition (this does not just apply to older folks). The stress from the prank could result in heart palpitations. Believe it or not, this has happened before. Know when enough is enough. Observe the other person’s reaction to avoid taking the joke too far. Be careful who you prank. Make sure you know the person well enough to gauge their reaction. If you play a prank on the wrong person, that person could get offended or angry. These rules are just a friendly reminder from your favorite insurance company to play it safe.